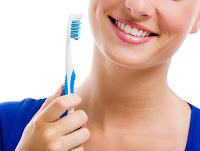 Colloidal Silver Secrets: Do You Really Need a New Nanosilver Toothbrush? More great consumer products utilizing antimicrobial silver are coming to market, slowly but surely. This is great news, because it’s a powerful way to help introduce the general public to the amazing, infection-fighting qualities of silver. Here's an interesting website on the new nanosilver-infused antimicrobial toothbrushes from a company called Mouthwatchers. At $5 per toothbrush, the price is definitely right. I'll probably buy one or two, just to say I've tried it. That way, I know I'm getting plenty of healing, soothing and infection-fighting colloidal silver on my teeth and gums during each and every brushing. That’s important, because nanosilver that’s been embedded into toothbrush bristles, by its very nature, is going to leach from the bristles over time. In other words, with each brushing over time, you’ll get fewer and fewer infection-fighting silver nanoparticles. And therefore, the protection afforded by the nanosilver-embedded toothbrushes will not be consistent – it will gradually dwindle over time. And eventually the nanosilver will be completely depleted from the bristles. So you have to keep buying new nanosilver toothbrushes over time, in order to keep the expected level of protection high enough. Now there’s nothing wrong with that. Like I said, at $5 a pop, these toothbrushes are well worth it. However, if you simply spray colloidal silver onto your regular toothbrush and toothpaste each day before brushing, you eliminate the problem with inconsistent and dwindling levels of infection-fighting silver. And therefore, you don't have to play the guessing game of trying to figure out when your new nanosilver toothbrush is "out of juice," so to speak. Frankly, I’m glad to see more nanosilver consumer products coming to market. And I applaud the makers of this new nanosilver toothbrush. After all, products like this serve a fabulous purpose in introducing the general public to the powerful disinfectant, healing and infection-fighting qualities of antimicrobial silver. That helps antimicrobial silver go mainstream, so to speak. And obviously, the more people that know about silver’s amazing healing qualities, the better. In fact, buying some of these toothbrushes as gifts for good friends or family members who might be unfamiliar with the powerful infection-fighting qualities of antimicrobial silver would be a great way to introduce them to it! But the plain truth of the matter is that if you have a simple pump-spray bottle of colloidal silver available on your bathroom countertop, you have no need whatsoever for such a product. You can simply apply your own colloidal silver to your toothbrush every time you brush, as you see fit. And because of that, you’ll never have to worry whether or not your toothbrush bristles still have enough nansosilver embedded in them to provide the kind of tooth and gum protection you’re looking for. Can Colloidal Silver Help Remineralize Damaged Tooth Enamel?